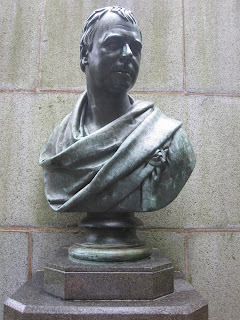 Sir Walter Scott is widely considered to be the creator of the modern history novel, and played a huge role in the rehabilitation of public perception of Highland Culture following the Jacobite Rebellions in Scotland. Scott was born in Edinburgh, Scotland, in 1771, and as far as I can tell he lived his whole life there (Scotland). His connection to Nova Scotia seems to be that the Hon. William Garvie, Nova Scotia's (then) Commissioner of Public Works and Mines, wrote an hour and a half speech about Scott in 1871 on the Centenary of Scott's birth. The speech, entitled "The Genius of Scott" appeared in an Edinburgh-published volume of Scott Centenary speeches from around the world, and was pronounced as "the finest of all that had been delivered." The Scots: The North British Society in Halifax were so proud of Garvie's address that it ordered a bust of Sir Walter Scott to be produced, which arrived in Halifax on September 21, 1932. 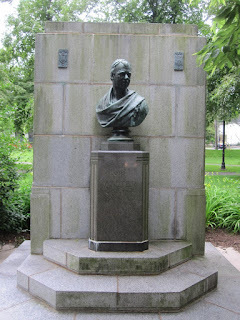 For the next 72 years the bust stood proudly at the entrance to the Public Gardens. However, in 2004 Hurricane Juan did significant damage to Halifax and the Public Gardens. After various restoration measures, the bust of Sir Walter Scott was moved across the street to Victoria Park, where it stands today.